A few days ago, a friend emailed me and said, "Have you seen this?" Whipup.net reviewed Knit Green! Lucky me, having friends to tell me this, since I obviously missed this and had my head stuck in the ground like an ostrich or something. How exciting! I'm not sorry I've missed the heat waves that have tormented my family in Virginia and the Professor's family in NYC. Winnipeg is having a warm day today. It's 30C (86F). Granted, we don't have air conditioning, but I'm not complaining...in fact, when I have a moment, I'm enjoying the warm (but not very warm) summer weather here! Please feel free to touch this rug, made from a torn old bedspread and an old white sheet! This “new” woven rug will give many more years of life to these worn-out textiles. 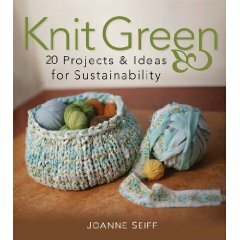 Joanne Seiff is a fiber artist who works with locally sourced, recycled or naturally produced materials whenever possible. She spins, weaves, knits, and dyes her pieces. Seiff feels it’s important to make and delight in using beautiful handmade things in our daily lives. This rug, created entirely out of recycled or mill end materials, will sit on a floor in Winnipeg one day soon for many bare feet to enjoy. The Professor summarized it as: "You sure do know how to make something out of nothing!" It still needs to be washed and finished but that was one quick project. Note: I know the stripes are uneven in width. That is ok with me. I'm a bit uneven in places myself! At the same time, I am about to finish teaching the first section of my "Technical Writing for Graduate Students" class. I am scheduled to start teaching another section (4 days a week) in August. I suggested the students bring homemade awards to thank each other, as we've done a lot of hard collaborative editing work and I wanted them to acknowledge their classmates' work. It was a whimsical idea for some very serious students. It turned out I got awards too! Here's a handmade crown, from one of my students and her young son. "Thank you...for helping me to like to write!" As part of my recent celebration of "cool" textures and ideas, I went wild and took two linen pillow cases out of their wrapping. I've had these brand new pillow cases since I went to Ireland with the Professor. I think we went in 2005. I bought linen textiles for everyone in the family then, but never actually used my own! The pillow cases have careful white on white embroidery on them and their crisp texture really appealed to me when I made the bed. I imagined laying down my head to sleep on this on warm nights. It's hard to catch a catch a photo of what linen feels like. It will soften and age over the years, and now that I've finally decided to use these things, I can't wait to see how soft they will become. I've still been keeping pretty busy. First though, I'm reading all your posts about books. We seem to be a relatively old fashioned lot who enjoy actual books. That is, except for those of us who would love for knitting books (including mine) to be available formatted for the latest Kindle from Amazon or for other e-readers. I've heard that it is hard to make knitting books available in this format because of the graphics, but it wouldn't hurt to ask if you're interested..the contrast and graphics software are improving all the time. Go to the Amazon page for the books you'd like (mine, for instance?) and say you'd like the publisher to make it available for Kindle... I figure it couldn't hurt to ask! We came home with more than enough apricots for a (very tart) pie. I also am freezing the apricots as pulp as they come ripe. When I have enough pulp, I'll defrost it and make jam. On Sunday, the Professor gave a talk at the Living Prairie Museum as part of their Monarch Butterfly Festival. It was a bright sunny day so we didn't mind sitting in a shady tent for a while to hear the talk. Also, it was pretty fun to see all these little kids listening intently to the Professor's talk while dressed up in life size butterfly wings, antennae, and face paint. Sunday afternoon, the biologists went off to yet another park to see more flora and fauna. I stayed home for a couple hours, worked on warping my loom and made a big dinner. It's amazing what some time outdoors does to stimulate the appetite ---People cannot live by apricots alone! That's what is going on here. House guest #7 left Monday morning right as we went off to the university for a busy day of teaching and research. House guest #8 arrives Thursday. Never a dull moment...or at least, not until it gets colder around here...February might be quiet in comparison! I'm hearing about more and more people who are buying their new books only as ebooks. This way there is a much smaller carbon footprint for their purchase. (No paper, no printing, no shipping--all in all, a very good and green idea.) I'm sort of old fashioned, so I still really enjoy buying my books as, well, books...but even so, I end up buying a lot of my books used so I know more than one person makes use of that original production energy. However, on thinking about it, it seemed to me that other people who were interested in buying Knit Green new might worry about their carbon footprints. It also seemed to me that if you were, perhaps, driving around to festivals with your copy of Fiber Gathering, it might be easier to transport as an electronic file. ....so I'll come right out and say it. 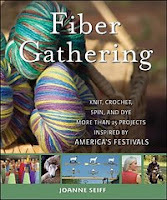 Also, did you know you could get Fiber Gathering online as ebook download? We have been in our house in Winnipeg almost a year. I can hardly believe it. I still feel like I'm brand new here--still learning new things every day. However, I am also seeing signs of home. Our Nanking Cherries are ripe, so I went on a picking spree this morning. There are still plenty to pick later. When I have time, I hope to put these up in jars as jelly or maybe cherry sauce. The container here holds 6 cups, and since each cherry has a big pit, it won't make a lot on its own. Still, I harvested these from our yard and I'm proud of the homegrown crop! In between teaching classes at the university, editing, and getting ready for houseguest #7, things have been busy. (For those who have been reading the blog a long time, the Norwegian Bachelor Biologist is driving up from his family's Minnesota cottage and coming to town! I can't wait to see him!) So busy, in fact, that I have felt a bit under the weather. However, it was nothing a little bit of antibiotics couldn't fix. Today, I celebrated the sunshine and our elms in their fancy summer leaf costume! The light dappled through those leaves and I took the dogs on a long walk. We went past the big houses, all the way to Munson Park by the river. It was a deliciously sunny day, with two happy dogs by side. It's good to be here. It's been quite a ride since last year, when we arrived in Manitoba on July 15th, 2009. My camera went along to Edmonton to a Biology of Butterflies conference while I stayed home. The professor and our resident student went along to a field trip afterwards to see some of those big mountains-- Canadian Rockies. This is good, because so far our resident student has seen Winnipeg. That would be --the flat flat flat (did I say flat?) prairie around here..and a couple of beautiful rivers. The field trip involved climbing mountains. Our resident student apparently fell several times into great mounds of snow (in early July) and got a little cold. She seems no worse the wear though, and it was definitely an adventure. Also, the field trip was something like 35 biologists, and they did not hesitate when they saw this sign at the trail head. Apparently they all headed right down that trail. Word was they kept looking around to see if there was anyone slower nearby who they could leave as a snack to distract the bears while they ran away. I heard all 35 biologists also came out alive at the end of the hike, so I guess the bears thought biologists were too chewy or something. I hope to get back to fiber arts posts in a while, but right now it's just beginning to be berry season, so along with teaching and editing, I feel some canning activity coming on...so prepare yourself for strawberry shots some day soon! I don't usually read the sports news, but this article caught my eye. Why? I taught 5 class sections (2 of Freshman Composition and 3 Remedial Writing) at Erie Community College on the North and City campuses in Buffalo, New York back in 2003. I'm proud to see the college in the news--plus, what a wonderful name this student has....really, go read the article. It's kind of neat. I'll be back with photos of the Professor's trip to Edmonton when I have a bit more time. In the meanwhile, I hope you're enjoying summer! Canada Day, the 4th...and THE QUEEN! The Queen was in Winnipeg yesterday. You know, Queen of England, Queen of Canada? That Queen. Pretty big deal. I didn't manage to see her. It was very very hot for Winnipeg (think Kentucky/Virginia/North Carolina levels of heat and humidity--but without lots of central air conditioning) and I chose to stay at home in the shade and avoid the crowds. That said, it pretty well made my long weekend to know she was just a couple of miles away! On Thursday (Canada Day) I woke up early, mowed the lawn, walked the dogs for about a mile and then walked to a friends' house. There, I had a lovely lunch with good company and some really stunning sparkling wine from Nova Scotia. Then we walked over to the Canada Day Street Festival to see all the excitement. After that, I walked home. Have I mentioned it was hot? One mowed lawn, 3 miles of walking, sparkling wine and the heat made me decide that I was done with celebrating at about 3pm that afternoon. I worked on measuring out a new warp for my loom in my dining room. I missed the fireworks and was in bed by 9! On Friday afternoon, I met friends for fish and chips at a local pub and went out to hear free jazz, including Trio Bembe. On Saturday I went to synagogue and spent the afternoon listening to the Queen's visit on CBC. Today I spent time with a friend who owns Shetland sheep. She came over to learn and talk about wool breeds and hang out. She brought me very nice croissants (an instant hit--what a way to make me happy!) and I'm dedicating the rest of my day to grading. Just me and the engineering grad students' writing assignments...but I might hang out in the backyard a bit now that the heat has broken. The sun is out, it's a holiday weekend, and I've had a blast!